A water resource can determine whether a specific community will prosper or not. This is because water is crucial to economic development, especially for poor communities in coastal areas with limited access to fresh water. 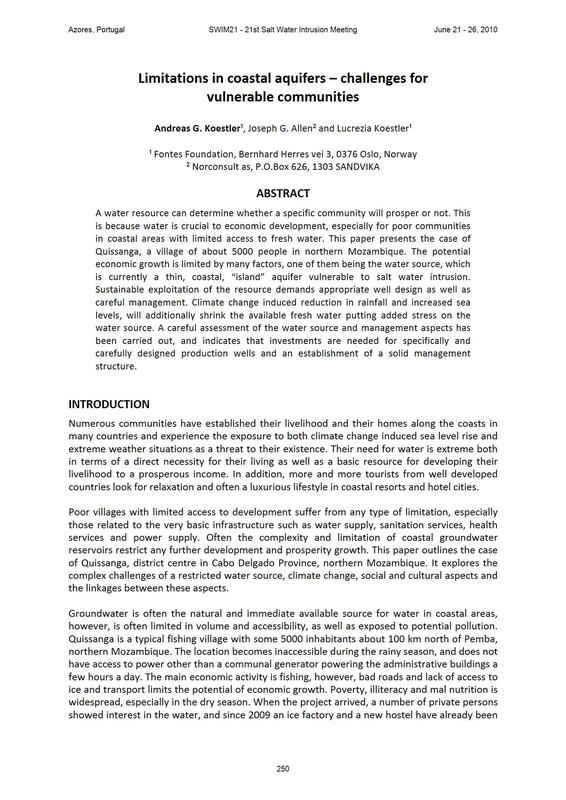 This paper presents the case of Quissanga, a village of about 5000 people in northern Mozambique. The potential economic growth is limited by many factors, one of them being the water source, which is currently a thin, coastal, “island” aquifer vulnerable to salt water intrusion. Sustainable exploitation of the resource demands appropriate well design as well as careful management. Climate change induced reduction in rainfall and increased sea levels, will additionally shrink the available fresh water putting added stress on the water source. A careful assessment of the water source and management aspects has been carried out, and indicates that investments are needed for specifically and carefully designed production wells and an establishment of a solid management structure.